This week, as we celebrate the country’s vital manufacturing sector, we are excited to unveil a new tool that will allow manufacturers to calculate potentially significant savings that can be realized by manufacturing in America. With the first iteration of Assess Costs Everywhere (ACE), we assisted manufacturers in deciding where to locate their operations by examining 10 cost and risk factors they should consider. This week, we present “the Cost Differential Frontier,” or CDF, as part of ACE 2.0. Developed by economists at the University of Lausanne, this calculator serves as a framework to consider total inventory costs and risks. ACE 1.0 examined factors such as labor; trade financing and regulatory compliance costs; product quality; shipping; travel and oversight; inventory; intellectual property; political/security risks; and other inputs to gain a better understanding about the sometimes hidden costs associated with manufacturing location decisions. Great work is underway to further our understanding of the financial implications of these factors. Applying CDF, businesses for the first time can quantify potential savings that would be derived from reducing lead time, in conjunction with other factors. Because customer demand often fluctuates unexpectedly, companies should carefully consider the value of a domestic supply chain with shorter lead times. Using offshore suppliers increases the time between order and delivery, often by months. As a result, the buyer must place the order based on a forecast. As the lead time gets longer, the range of demand levels that must be considered becomes wider. These fluctuations lead to costly stock-outs or overstocks. The savings from offshoring may need to be large (20 percent or more) to compensate for these mismatch costs between supply and demand. Applying CDF, manufacturers can calculate exactly how the long supply chains and uncertainty add large hidden costs to production. 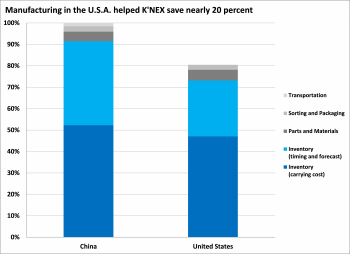 Moreover, real-life examples such as the successful reshoring story of U.S. toy manufacturer K’NEX demonstrate that the promise of ACE is more than just theoretical. Indeed, with ACE and CDF, a truly compelling case for reshoring is emerging.